Deborah G. Culbreth, 61, passed away November 22, 2018. She was a loving mother, wife and friend who enjoyed taking care of her home and family. As a lifetime member of the Poquoson Volunteer Fire and Rescue Company she thrived in helping others. Preceded in death by her step father and mother, Richard and Jean Jay; sister, Joy Ross; Father, Arthur Gooch; and granddaughter, Mattie May Constein. 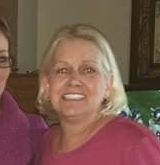 Deborah is survived by her loving husband of 17 years, Andrew Culbreth; daughter, Amber Constein; sons, Mike Chauvin and Brad Chauvin; step-children, Tanya Schneider, Brandy Atkinson, Jessica Hunter and Shaun Culbreth; 16 grandchildren as well as many other loving relatives and dear friends. The family will receive friends 5:30-7 p.m. Tuesday, November 27th at Claytor Rollins Funeral Home. In lieu of flowers memorial donations may be made to the Poquoson Volunteer Fire Company, P.O. Box 2404, Poquoson, VA 23662. Condolences to ClaytorRollins.com.